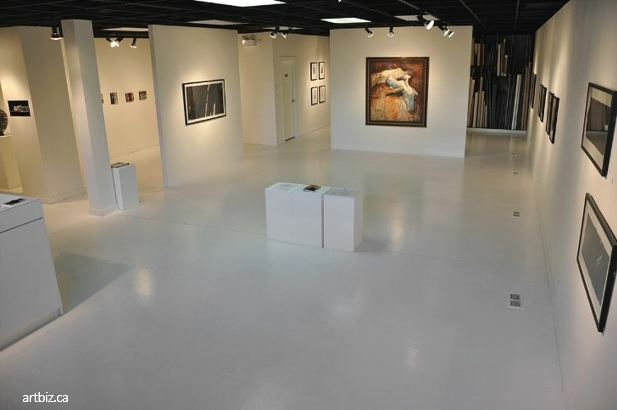 There’s a reason why galleries have white walls and minimalist environments. That reason is that nothing is to interfere with the viewing of the art. Nothing! I started using WordPress in 2004. At that time minimalist websites just weren’t done . When searching the WordPress theme depository, I found many themes that showed off the graphic designers prowess but did nothing to put the focus on my fine art. I used search terms like art, fine art, photography and even design and architecture. Invariably this is what I found . 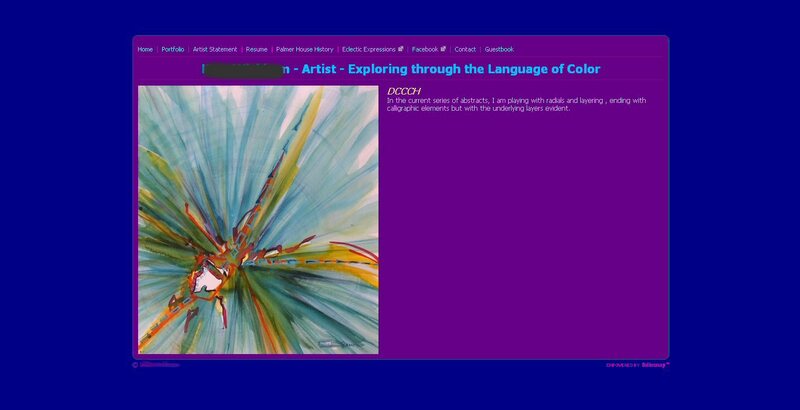 Since I could not find what I needed for my fine art, I started to design fine art websites and themes. Themes that were simple and clean. Themes that allowed the end user to make their art the focus of the site. In the design world this style was called “vanilla”. Now a days the minimalist vanilla theme is trending! 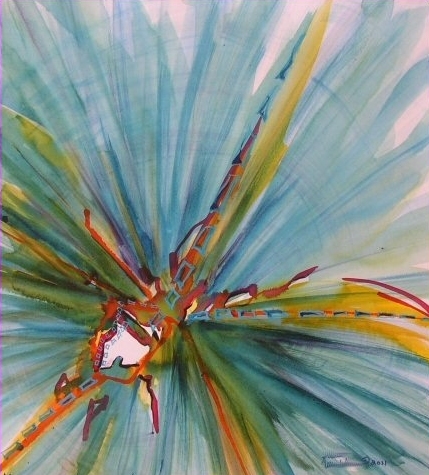 I really like Verna’s site because the images showing the tools she uses in her work are very intriguing. Even though a vanilla fine art website will work for all types of art, I’m not saying that the design for fine art websites has to white. It doesn’t! There are many shades of gray, soft pastels or the use of graphics that relate to a body of work. For example Warbrides.com. 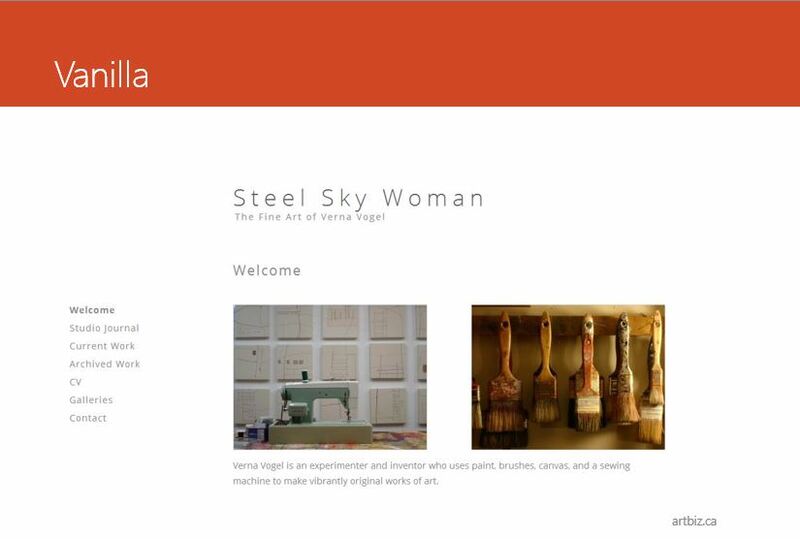 This is the website of Canadian artist and Royal Canadian Academy of Arts inductee, Beverley Tosh. 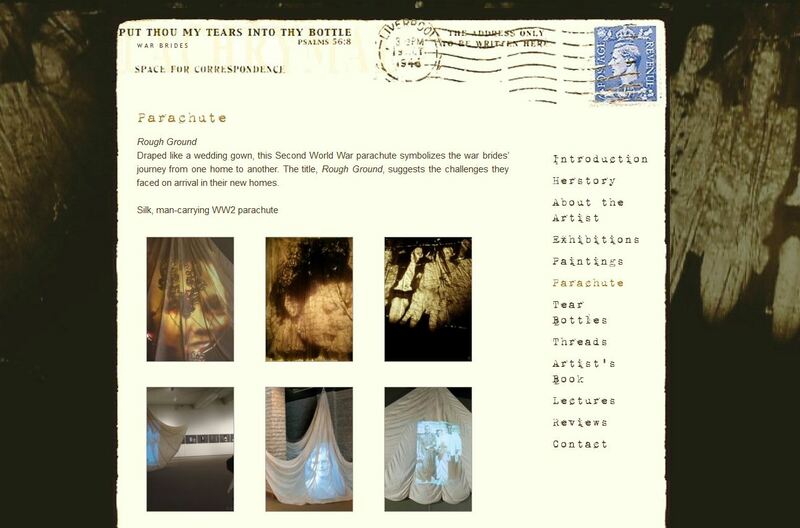 Bev’s work is about WWII war brides and she wanted the site to reflect that era. We used simple graphics and typography but used larger thumbnails so the focus stayed with the paintings. We also used one of the installation images from Bev’s One Way Passage exhibition as a background. Graphics are okay when they reinforce the artwork. I like to use the artists actual work for graphics when designing custom sites. Taking in to account the artists’ work is also very important when designing fine art websites. Take for example the wonderfully delicate work of Mary Lou Blackledge. Mary Lou’s series Soul Stories has very fine line. When placed on a white background it washes out. The solution was to place the work and only the work on a darker neutral ground. Mary Lou has a unique signature which we turned into a graphic and used as a header image. Her site name is also presented in plain text in the upper right corner. Coloured backgrounds are okay so long as the colour doesn’t compete with your art for attention. I call the above image “blue murder” because the colours are killing what otherwise is a decent abstract painting. This is one of those do it yourself sites that artist pulled the colours from their palette thinking it would enhance the painting. Unfortunately the colours are overwhelming the image. Here’s the painting without the coloured background. It’s much easier to appreciate. I’ve seen 1000’s of art websites over the years and have developed a pet peeve about the lack of content. Words are really important, not only for search engine indexing but to educate site visitors about what your work is about. Follow this list of design suggestions for your fine art website that will provide a good visitor experience. There is an art to design. 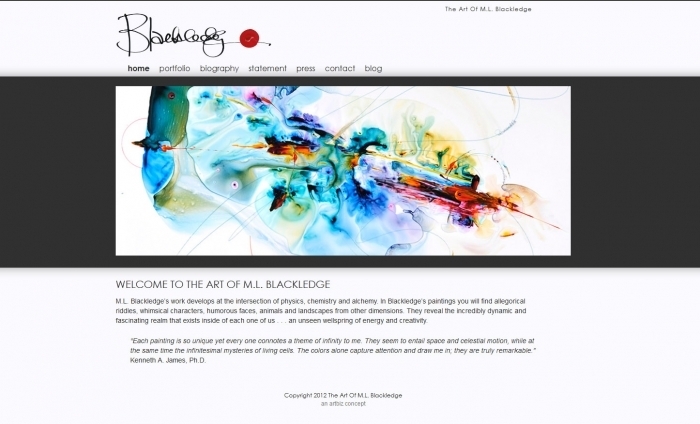 Design for fine art websites should reflect your art. The WordPress Themes for Artists are RESPONSIVE! This is a screenshot of the David theme on an iPhone. It looks equally as good on iPad, Tablets and Smartphones. Responsive means that your website’s content will shift to fit the size of the window. Images will also reduce to fit; everything will reduce to fit. BUT the text is still readable, actually it’s easier to read on a responsive theme because you don’t have to scroll sideways. Once the theme gets small enough the menu collapses into a button drop down on all the David themes. Note the image at the top of this page. It’s a jpeg and it’s called a feature image. All the David themes take advantage of the WordPress featured image, making it a header image of sorts for each page or post. There are a number of options to work with to get your site the perfect header. Included in the theme is a source file for Photoshop that you can use to create a header image with text. The showcase template is a page template that comes package with all David themes. It can be applied to any page and shows all that page’s content followed by a list of your most recent blog posts. The showcase template makes a great home page to feature the content of your site. One of the greatest features of WordPress is that you can use it as a blog – a website and a blog combined – or simply just a website (no blog). Visit the preview site to see how the blog and website can be separated or combined with a simple menu item called blog. There are three widget areas on all David Themes. Two sidebar areas and one full width footer area. The page sidebar widgets appear only on your pages. When people click-through to your blog the widgets that you add to the blog sidebar will appear. The footer widget appears on both pages and posts. 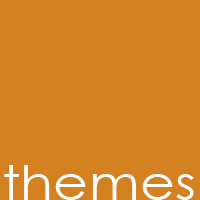 Test Drive all the David themes live with more theme information and features. There’s also a theme changer so you can see and interact with all the themes. 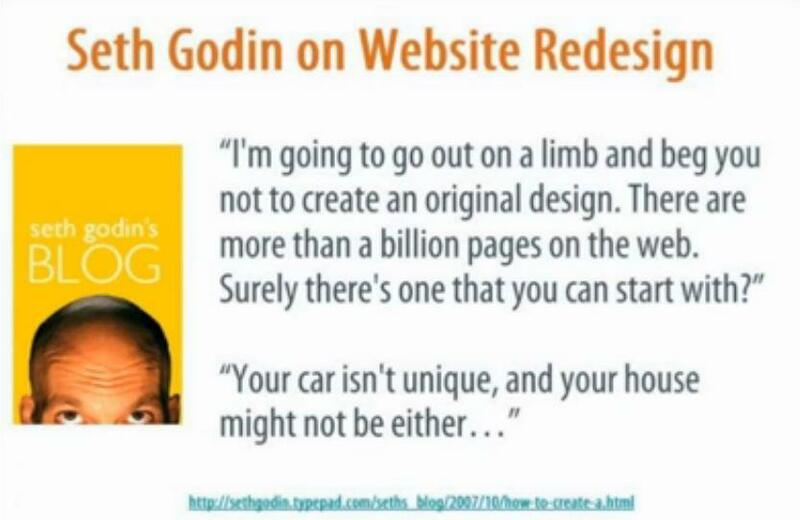 Perhaps when it comes to selecting a WordPress Theme for Art; Seth Godin said it best. A WordPress theme is the structure and look of your site, sometimes referred to as a template, a theme can be easily changed without disrupting your content. 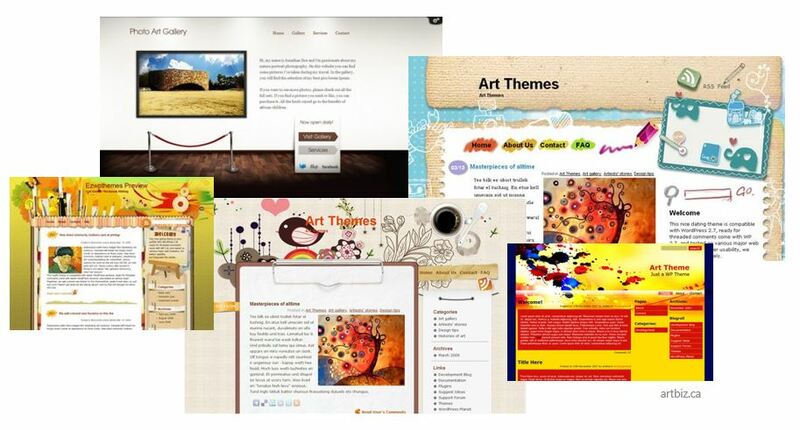 When selecting a WordPress Theme for Art look for the following items. As an artist you do not need a tripped out theme with tons of functionality. You have better things to do than signing up for a forum to learn how to use it.The most important thing on the site is your art and everything about your theme should support that. Keep it simple. Choose your colours carefully. If you are a colourist and have a bright and vibrant palette you know that colours, when placed next to each other, will affect each other. It is therefore imperative that your images are viewed on a neutral background. Let your visitors see your art as it should be seen. 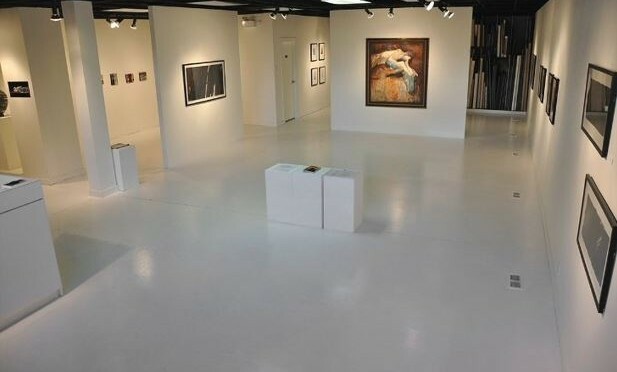 There is a reason that higher end art galleries have white walls. If you prefer not to write a blog, your theme should be able to support pages only. The sidebar should be widget ready so you can add items other than blog categories and archives. A good theme should support WordPress built-in menu system for your sites main navigation. WordPress menus allow you to drag and drop menu items into any order you like. Even build custom menus that you can add to a widget ready sidebar. Select a theme that provides the option to upload and replace the header image with one of your own. And a theme that let you change background images and background colours. As an artist you don’t need the fanciest of themes but rather a rock solid coded theme that allows ease of use and lets you change a few things. I purposely left out how the theme displays images because with the NextGen Gallery plugin the point is moot. What do you want your theme to do? Change colour? Change Fonts? Change Layout?